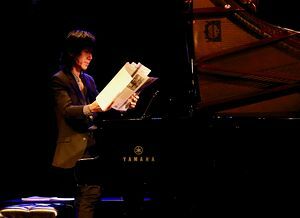 Each part of Olivier Messiaen’s kaleidoscopic “Catalogue d’Oiseaux” (“Catalog of Birds”), which the pianist Taka Kigawa performed with preternatural ease over more than three hours on Monday, comes with a prose introduction. The text, while helpful for curious listeners, also provides clues for musicians to interpret 77 bird calls and evocations of nature. The paragraph that precedes “Le loriot” (“The oriole”) contains references to light and rainbows, and ends with the sun “spreading golden rays of the oriole’s song,” rendered through rich chords that penetrate flittering transcriptions of bird song. In an interview before the performance, Mr. Kigawa said that his take on “Catalogue” is longer than others because he tries to take “a lot of space and silence.” These chords were one such instance: Already majestic, they became almost holy in his hands. Read our interview with Mr. Kigawa about preparing for Messiaen’s bird song marathon.